The Camargue reserve covers 13,000 ha, naturist walks through ponds, bird watching, walking and horse rides, sea cruises, St. Mary and the Church, the Feria in July, the battlements of Aigues Morte, the fishing port of "Grau du roi", the vast beaches, gypsy evenings ... .. The Quarries of lights, located at 1 hour from the lodges. The Oustaou offers wonderful events each year : in 2015 will be staged the masterpieces made by Leonardo da Vinci, Michelangelo, and Raphael between the end of the fifteenth century and early sixteenth century in Florence, Milan and Rome. Set in motion through an advanced technological device combining music and picture to perfectly fit to the space, digitized artwork come alive on the floor and walls of the quarry transformed into gigantic picture rails. You are invited to walk freely in the Quarries area (7000 m2) for a dynamic visit. Guided through the show with songs carefully chosen ! At the heart of the Alpilles, the monumental Quarees Lights of 14 meters high, host unique multimedia shows in the world. A meeting between nature and the human labour, the land is fiery red, orange sometimes. Furthermore she can pull also towards the yellow or even green. The ochers colour the landscapes of the Luberon. Following the withdrawal of the sea there are several million years, the accumulated limestone deposits were converted into ocher sand under the heavy rain effect. Ocher was first used for cave paintings, and was rediscovered during the Revolution and marketed during a century in the world for its unchanging coloring properties. Natural pigment, ocher comes back in force, reviving many activities related to the painting, decorating, pottery and construction. 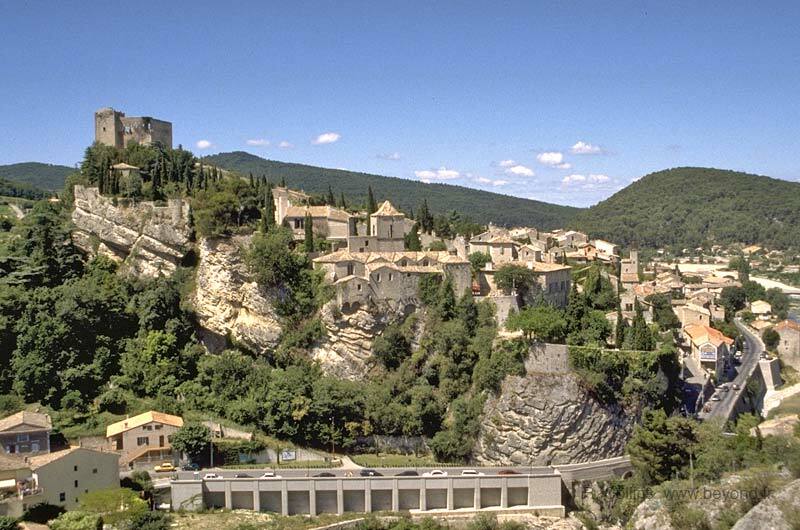 Located at 650 meters of altitude, between the Lure mountain and Luberon, "Simiane la Rotonde", located at 1 hour from the Oustaou, is classified city of character, one of the most beautiful villages of High Provence. Dominated by its immense rotunda in the shape of crusader's helmet, with paved streets, mullioned windows and doors of stately houses, testify to a history of an intense activity between the fifteenth and eighteenth century. Lavender : The ambassador of Provence in the world. Its bright color and its delicate flavor are a permanent invitation to travel. This little purple and blue flower is the cousin of thyme, rosemary and sage. In summer, its fields draw the landscape and offer to visitors a unique panorama with purified air. Harvesting is done mechanically or manually when the lavender reached the height of its flowering. At this time,it is the fragrance of scents that invade through the country of Sault disseminated by the smoking chimneys of distilleries and travel boxes filled with freshly distilled lavender. The lavender essential oil is highly sought in pharmacy and aromatherapy for its medicinal and therapeutic properties. Besides the Greeks and Romans used it for healing or scent their bath. Much more than an aromatic plant, so it's a bit of our History which grows on the Sault plateau in the heart of an AOC production area. Fine or true lavender is a lipped, which is one of the great families of aromatic plants. The lavendin is a hybrid plant from a cross between fine lavender and spike lavender. Period of flowering and harvesting: In the land of Sault and Valensole, fields of lavender and lavendin bloom together of concerts in july. This is the rainfall and the spring warmth that determine summer flowering. Mid-July, the harvest begins with manual cutting bunches followed by the ballet mechanical cutters in fields that will last until about mid-August. City of art and culture, Marseille is a unique place with a thousand wonders. Visits of beautiful sites such as Notre-Dame de la Garde where there is a 360 degree view on the city which is impressive, the Palais Longchamp or the district of "Le Panier", but also a true Provencal life art. Visit Marseille by visiting the Old Port, a real gathering place and a symbol of the city. Stroll also on the famous avenue the Canebière and for shopping : it is in the street St Ferreol and rue de la République. Marseille and its surroundings, it is also many colors markets : Plaine market, Prado market or the market of Capuchins and all markets of the Blue Coast. Avignon, located at 1 hour from the Holiday Village Oustaou of Luberon, Capital of Christianity in the Middle Age, has retained the imprint of this magnificent destiny: Papal Palace, the Bridge Saint Benezet, known as "Pont d'Avignon", known around the world thanks to the song, ramparts, an exceptional monumental set classified as World Heritage by UNESCO, dozens of churches and chapels, many vestiges of a rich history past that give to the city a unique atmosphere. Home of a prestigious contemporary theater festival, European City of Culture in 2000, Avignon has many museums, an opera theater, exhibitions and a conference center in the edge of new technologies integrated in the heart of the Palais des Papes. Orange, a Roman city of two thousand years of History. 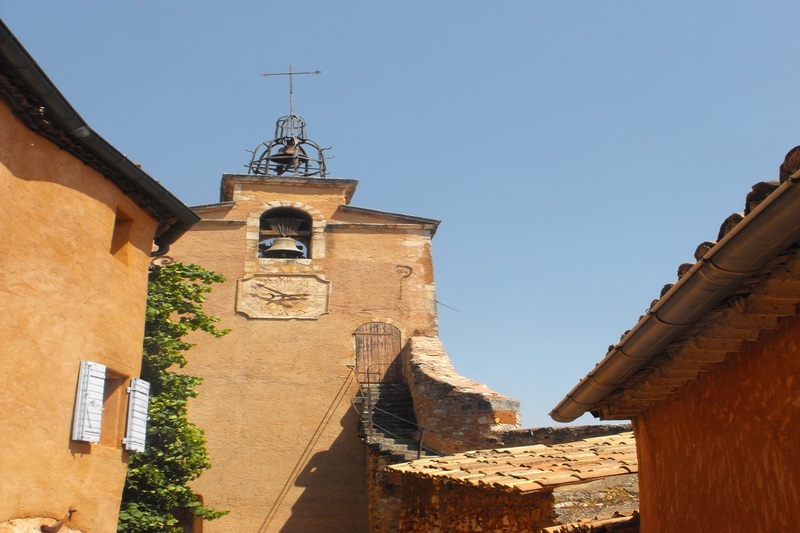 Its location in the heart of Cotes du Rhone, Orange has remained since Antiquity an important place of passage. The Ancient Theatre of Orange owes its reputation to the exceptional preservation of its stage wall. This was the essential place of the city life where we broadcast Roman culture and language. The "Arc de Triomphe" is an exceptional example of Provençal Roman art. To complet these two monuments, the city of Orange offers to its visitors an Art and History Museum, housed in a private mansion of the 17th century and has a Gallo-Roman section and a dedicated section on the history of Orange from prehistoric times to the present. Finally, thanks to its sunny climate, the city is surrounded by prestigious vineyards such Gigondas and Chateauneuf du Pape. Former capital of Voconces, Vaison-la-Romaine was a prosperous Roman city as evidenced by the remains of houses and high quality design of monuments still visible nowadays. A stroll on the Villasse site whose columns draw the old shops organized around baths, then, you can visit the Puymin site with his antique theater dugs in the north side of the hill. The Roman bridge, a major architectural monument, links the lower town to the medieval city. The visit of the Archaeological Museum Théo Desplans will be an opportunity to approach closer to the remains sumptuous sets.